Week three of the French Top 16, and some interesting differences have opened up between the two eight-team pools that the championship is divided into, until the play-offs next year. Pool A is not unexpectedly being dominated by champions Montpellier who ran up the biggest win of the season so – 91-10 against newly-promoted Villelonguet, who look favourites for the basement position in this league at least having shipped 193 points in just three games. This weekend Montpellier ran riot, with 15 tries. Remarkably Villelonguet briefly lead thanks to a third minute penalty, after which it was all one way. With Scotland’s Helen Nelson on great form with the boot, with eight conversions adding to a try fo her own, but even her 21 points were surpassed by Cyrielle Banet who scored six tries. Montpellier top the table with three bonus point wins, while just behind them lie the team they beat in last year’s semi-finals, Blagnac who gave Romangnat – bottom of the Top 8 last season – their first defeat of this season in Toulouse, a yellow card early in the first half not helping the visitors, giving Blagnac an early advantage that they maintained throughout the game. Even so, Romagnat still lie third with only Rennes from last year’s Top 8 languishing in the lower reaches of the pool thanks to a 15-10 defeat in Paris to Stade Francais, who look one of the stronger of the newly promoted teams having built a squad over the summer than now includes internationals Laurelin Fourcade, Lenaig Corson, Chloe Pelle, Coumba Diallo and Assa Koita. This weekend the crowd for the game also included two international coaches (France 7s and Italy) who saw Stade win a tight game, despite missing the several first choice players though injury. Stade now lie fifth above Rennes, but above them are Lons who recorded their second with, 38-26 at home to Rouen. While Pool A is generally going as might have been predicted, Pool B is looking a little different. 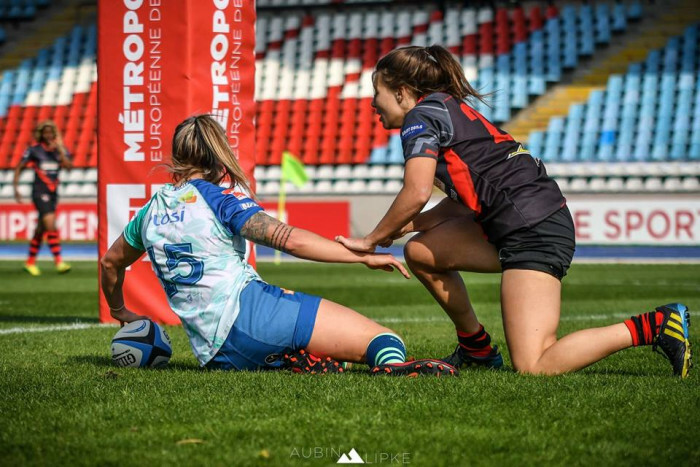 Toulouse – finalists last year – do lead the way having taken Caen apart with an unanswered 11-try 63-0 win at the weekend, but in second place – and on equal points – is newly-promoted Grenoble Amazons thanks to a third win, this time 39-10 against bottom team Tarbes. It is an impressive – and perhaps unexpected - start for a team that lacks any of the big names that clubs like Stade have been able to sign up. Even so – and despite conceding the first score – Grenoble ran in seven tries from Céline Espit, Lou Noël, Emilie Mathieu, Shwana Waiwai and Coline Baillon. Bobigny lie third after a narrow 26-24 win over Lille, who are still looking to reshape themselves with their new coaching team and largely new squad. They have retained Scots Chloe Rollie and Lisa Martin this year, however, and they were a major factor in keeping the northerners in the game with a try each that gave Lille a 17-12 lead at halftime. But the Parisian visitors clearly had the better of the locker room talks, and burst out of the blocks to go ahead after 44 minutes, and extend their lead to 26-14 midway through the half. The Scots combined (Rollie scoring her second try, Martin converting) to bring Lille to within two points on 77 minutes – but the comeback was too late. As a result Bayonne were able to slip into fourth above Lille after a 26-13 win in Bordeaux. The Top 16 rests next week as France starts to prepare for next month’s visit by World Champions New Zealand.